Learn methods of analysis for deep foundations in stratified soils. This course is intended for civil engineers, structural engineers, geotechnical engineers, geologists and other design and construction professionals wanting an introduction to methods for analysis of soils and rock to determine load bearing capacity. This course will give engineers and others an introduction to shear strength parameters, tension forces and methods of analysis to determine load bearing capacity of soils and rock. 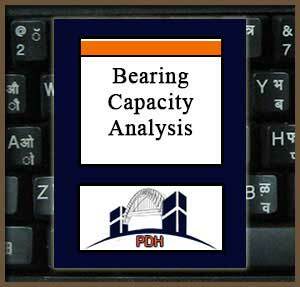 This is an introduction to analytical methods for analysis of soils and rock to determine load bearing capacity. This course will give you an introduction to methods for analysis of soil and rock load bearing capacity..